Price: 13.95 Euros available from specialist book and hobby shops, or direct online from AirDOC Publications. Advantages: Includes developmental and operational summary of this important Luftwaffe type; large, well reproduced photos; German/English text; attractive profiles. The Junkers Ju 87 resulted from a requirement to attack targets with pinpoint precision at short notice in support of ground troops. The high stresses imposed on the airframe during pullout from a vertical dive dictated a design that was robust and had some very specific characteristics. The result was the distinctive gull wing and fixed spatted undercarriage of the Junkers Ju 87 "Stuka". The initial production type was the Ju 87 A (Anton), powered by the Jumo 210 D 12 cylinder in-line engine. This was replaced in 1937 with the Ju 87 B, up-engined with the more powerful Jumo 211 A. This was the archetypal version, the Blitzkrieg's "poster plane", feared in the first year of the war as much for its screaming dive as its destructive potential. However, loss rates were devastating in the skies over Britain between July and September 1940. The Stuka was mercifully withdrawn from operations as the Luftwaffe focused its bombing campaign on London. Even so, this setback for the Stuka was not the end of the story. The Ju 87 continued to be used successfully on the Eastern, Southern and North African Fronts in dive bomber, ground attack, anti-tank and even glider tug roles until the last months of the war. Over the last five years or more, AirDOC has very effectively documented modern Luftwaffe types in addition to NATO allies over Germany. AirDOC now turns its attention to the wartime Luftwaffe. "Junkers Ju 87 Stuka Part 1 - The Early War Variants a, B, C and R of the Luftwaffe Dive Bomber" by Manfred Greihl is the fifth in their WWII series. The book commences with a bilingual text summary of development, production, technical description of the Junkers Ju 87 A, B and R series plus a very brief operational summary. This opening section also includes a table listing the main sub-variants, their roles, powerplants and armament. Even more interest is added to the book via seven colour profiles, including a helpful four-view illustration of the complex four-colour pre-war splinter scheme of RLM 61, 62, 63 and 65. 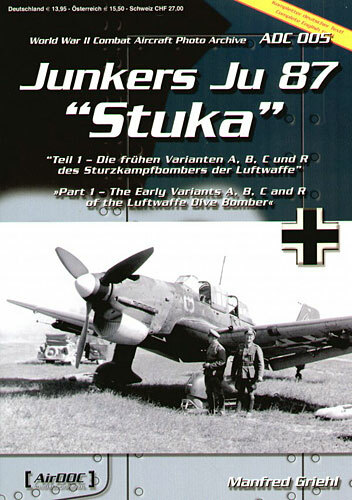 "Junkers Ju 87 Stuka Part 1 - The Early War Variants a, B, C and R of the Luftwaffe Dive Bomber" is an compact modeller's reference for this famous Luftwaffe dive bomber.